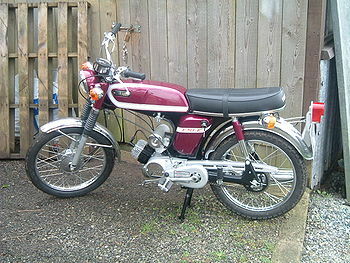 The Yamaha FS1-E is one of the definitive 1970s sports mopeds. They were produced in their un-restricted form between 1972 to 1977 then in various other forms to 1980. They were all 50cc but the later ones after August 1977 were restricted for legal reasons to a maximum of 30mph, the earlier ones were capable of about 45 to 50mph and returned about 95+ miles per gallon. The FS1-E has enjoyed a renaissance for the past few years as the original 16 year old owners have now become 40+-year olds with some spare cash are looking to relive their youth by buying and restoring these wonderful classics. Such is now the demand for Fizzys, the prices for both the mopeds themselves and the spare parts have risen sharply with some restored models fetching in excess of £3,000. I am also pleased to say that the FS1-E also has a new generation of owners with many 16-year olds opting to own an old classic Fizzy rather than opting to buy a modern scooter, and thus keeping the Fizzy spirit alive going forwards. There have been various enthusiasts clubs and websites set to cater for this renewed interest. The extent of work carried out varies greatly, from simply getting a bike running to complete restorations and engine transplants (usually from the similar YB100). In total there were about 200,000+ produced for the UK market and it is estimated that only 2,000-3,000 still exist so finding one in a barn or old lock-up is becoming increasingly rare. The FS1-E had the ability to be powered by pushbike type pedals since this was a legal requirement in the United Kingdom at the time for mopeds. The special pedal cranks allowed both pedals to be rotated forward so that the pedals would form motorcycle-style footrests in normal operation. To engage the pedals, the left-hand pedal crank could be rotated back and locked and a drive gear engaged allowing the user to pedal. A short chain connected the pedal drive to the main engine-chain drive system. Pedalling was hard work for the rider: there was no freewheel and the pedal gearing was very low. The engine could be started with pedal drive engaged, causing the pedals to rotate under engine power when the bike was in gear. In practice, the cam and shaft arrangement to engage the pedals frequently seized (in normal operation, a rider would never engage pedal drive; it was less tiring to push than to pedal). Engine: Two Stroke 4.8 bhp rotary disc valve induction, single carburettor, wet sump, 4 gears, with a 20: 1 mix of petrol to 2 stroke oil. Electrics: 6v lead acid 3 cell battery, backlit speedometer with neutral light, horn, high and low beam light switch and indicators switch. 3 position ignition switch (off, on, lights). On most models this was mounted on the L/H side panel, however the switch was moved to the conventional position between the handlebars on the DX. Performance: Maximum Speed 40-45 mph, 95 mpg or more. Right hand side panel contains a basic toolkit in a plastic case, pliers, 3 spanners, double ended screwdriver, plug spanner. Use all genuine parts as pattern parts don't fit properly, don't last well and look naff! Paint the frame, do not powder coat it, they rarely look right with so much powder coating on them. Use London Chroming, they provide an excellent service and do a great job. Make sure your wife loves you very much as you will be spending endless hours in the garage. This page was last edited on 21 January 2011, at 17:37.